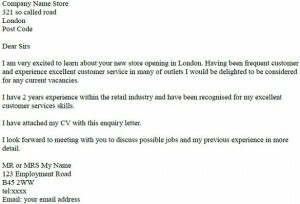 Enquiry letter example can be used for your job hunting. If you are contacting an employer who hasn’t advertised a current vacancy then this letter is the best way to introduce your CV and be the first (or only) applicant for the job. Actually finding out about new jobs can be the hardest part of the job hunting process and that’s why sending in an email or letter or enquiry can be a good idea. This article will look at some of the areas you should note when writing your letter. It’s your first point of contact! You are making your first impression here, so it is important to to take care when writing your letter. It is only a letter after all so you don’t need to be telling them your life story (you should be including your CV anyway). Be formal (business formal) and to the point – chances are that the person reading your letter or email will be very busy. Explain brielf why you are looking for a new job. Don’t go into much detail if your history is messy though! Say something about why you are interested in working for their company. It doesn’t need to be long – just explain in a way that won’t be in your CV why you think you are suited to a job with their company. End politely – thank them for taking the time to read your letter and keeping you in mind for any available positions. You can easily use the same template letter for all your enquiries (and if you know how, creating a Word template with an Access database of contacts to merge is easy enough) – just be sure to not do anything silly like leave references to other companies in the letter! Please find enclosed my CV in application for any positions you may have available in your marketing department. I would very much appreciate consideration for the available position as I feel I can bring solid experience and skills to your team. I have 4 years account management experience working with an agency and 2 years in-house product marketing experience working for Big Blue Widgets Inc. I am available for work immediately. Thank you for taking the time to read over my CV. I look forward to hearing from you.